Elliott Wave & Elliott Wave Theory Expert | NEoWave, Inc.
Get detailed forecasting for the S&P, T-Notes, Gold and Euro. Get articles, interviews & Glenn Neely's Mastering Elliott Wave. Many trading services offer advice that is contradictory or difficult to decipher. These ramblings might cover every scenario or hedge every bet. How long do I hold my trade? Where do I put my stops? When do I get in? Get out? NEoWave's Trading service is different. Making money is in the details. That's why our clients trust NEoWave to guide them. In fact, many NEoWave clients are professional money managers, brokers, and traders. And many have been customers for more than 20 years! Discover what makes NEoWave's Trading service unique – and profitable. 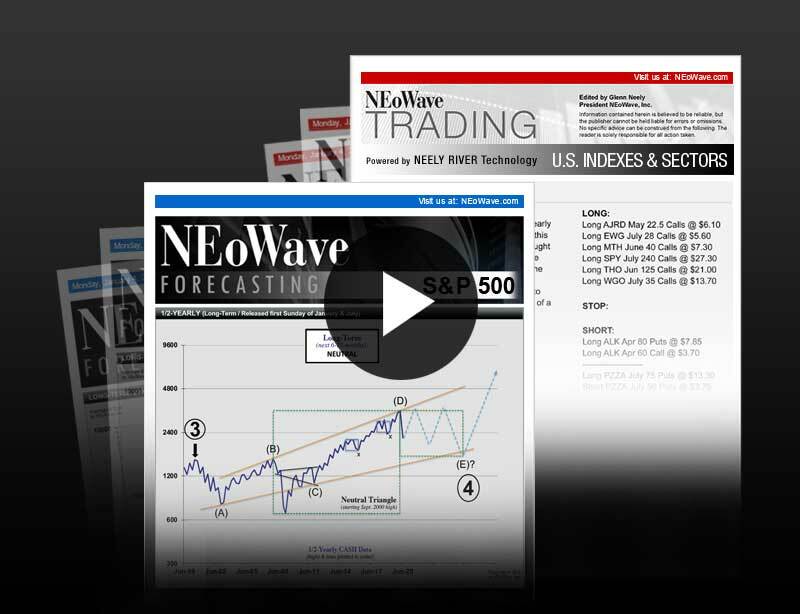 Glenn Neely's NEoWave Trading service gives you precise trading recommendations. With a focus on effective trades and capital preservation, this trading service offers an uncommon level of detail and specificity. No guesswork is required. And there's no need to spend your time analyzing markets. This service does the work for you – just read the updates and place your orders. This trading service provides detailed recommendations for all major world equities, commodities, currencies, and fixed income. "Using NEoWave, I have made a return of 17% in just 4 months." – M.K. "In just 3 months I have almost tripled my 401k." – J.G. "You're helping me reach my financial goals." – P.C. Do your market predictions often miss the mark? Do you produce contradictory bearish and bullish scenarios? Does your analysis yield real-world trading profits? 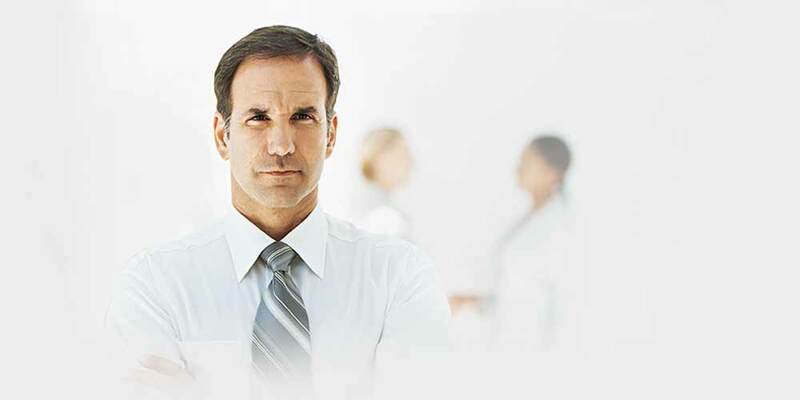 Create more accurate forecasts – without contradictory scenarios. What are the differences between Elliott Wave Theory and NEoWave? Unlike Elliott Wave Theory, NEoWave is not based on intuition. 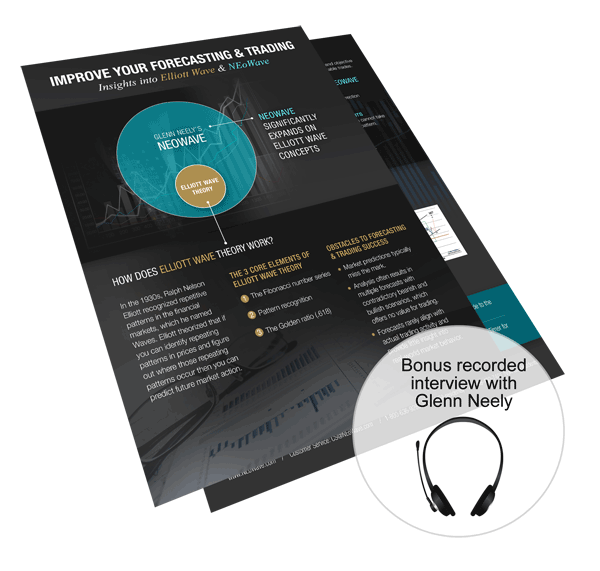 Instead, Glenn Neely's NEoWave Forecasting service presents a logical, scientific, objective approach to Wave analysis – a proven approach that results in more accurate forecasts. In addition, with conventional Elliott Wave Theory the analyst hopes the market will move up or down a certain number of Waves. Using NEoWave techniques, you make sure (after the fact) that a pattern did not take too much or too little time, that it was not too complex or too simple, and the post-pattern price action achieved the minimum movement necessary to solidify the prior pattern. Improve your Elliott Wave analysis: Gain insights and learn advanced techniques. When you subscribe to NEoWave's educational Forecasting service, you'll learn advanced Elliott Wave analysis. Every week, you'll receive charts presenting forecasts on the markets of your choice (the S&P 500, Gold, T-Notes, and Euro currency) along with Mr. Neely's insightful analysis. Our customers often ask if there is an automated trading and forecasting software available, specifically an Elliott Wave software program. Unfortunately, no software program can predict how the markets will move. Click to read Glenn Neely's thoughts about the likelihood of developing Elliott Wave software. NEoWave's advanced forecasting techniques have revolutionized Wave theory. 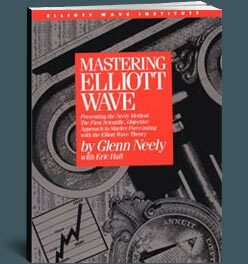 Glenn Neely is author of the classic Mastering Elliott Wave – a step-by-step guide to the most logical, objective Wave forecasting approach ever created. In this book, Mr. Neely presents his revolutionary techniques to objectively analyze market conditions based on his decades of Wave analysis and real-time trading. This unprecedented enhancement of Wave theory presents a more comprehensive and more accurate method to conduct Wave analysis. "Glenn, the time has come – the Swiss villa is finished and I am flying over to move in. As I look over the years I have used your NEoWave Forecasting method, I must thank you. Without your guidance, I would never have made the fortune I have." "I used to get trading reports from [another Elliott Wave company], but the focus was on technicalities of the wave – not on good entry or exit points. Without the translation to market realities, that information was useless to me as a trader. Glenn, I love the clarity of your updates. Keep up the great work!"